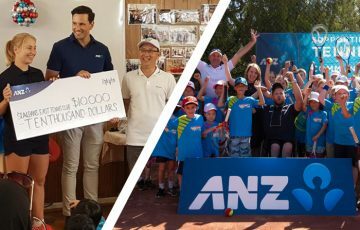 The Leongatha Tennis Club is thriving in Gippsland and it’s no wonder when it has a community of committed volunteers steering the club. 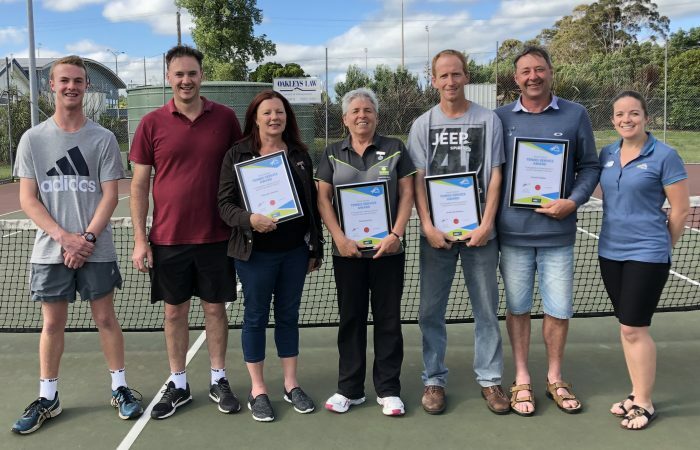 On Sunday 10 December at the annual Christmas party, Leongatha Tennis Club President Glenn Kleeven and Tennis Victoria Senior Participation Leader Tanya Mason were on hand to present Tennis Service Awards to four very worthy tennis volunteer administrators. A Tennis Victoria Service Award is decided by the Board of Tennis Victoria and is an award to recognise persons who have demonstrated their contribution to the sport of tennis through devoted and significant service to any one or more of the State Tennis Association’s affiliated tennis clubs and/or associations and/or member organisations. Service to other tennis related bodies may also be recognised. The nominee will have completed a considerable tenure of continuous or broken service. 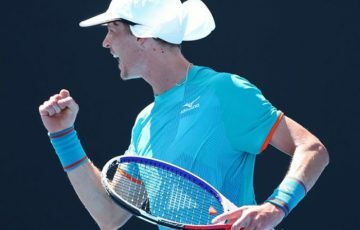 Greg Marshman first became a member of the Leongatha Tennis Club committee in 2007, and he remains a very prominent member to this day. Greg’s main role within the club is the role of night tennis coordinator. Greg said “I kept night tennis running and now my kids are into it and they love it and they’re having a good time and that’s what it’s all about.” Greg has also spent 8 years in the club position of Vice President since he first joined the committee. Greg coordinates the thriving night tennis competition, but Greg also spends countless hours completing the small jobs that need to be done, such as putting the bins out, getting the balls out, and replenishing the drinks machine. Rhonda Newton began playing tennis at Leongatha Tennis Club in 2005 before she took on her first official role in 2008. She was appointed as the Treasurer until 2009 when she stepped down for a year, only to be reappointed a year later. Marg Barter first joined the Leongatha Tennis Club in the early 80’s. It wasn’t long before she took on her first role at the club as Secretary, she did this for 10 years before deciding to step down from the role. A couple of years later though she was asked if she could take on the role once again, and she obliged for another two years. Other jobs within the club that Marg has taken on include being a part of the Saturday competition team’s selection panel, a role she’s played for over 15 years, night tennis committee, club memberships and she’s always been an all-round club delegate. Five years ago Marg was presented a life membership of the Leongatha Tennis Club. “Small clubs are run by their volunteers. If you want to be there and doing stuff around the club, it’s best to participate. I’m a big believer that Leongatha is one of the best places to play sport so keep playing everybody,” said Marg during her speech. 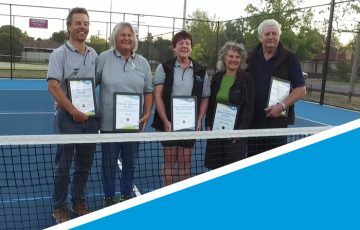 Tennis Victoria congratulates Marg, Rhonda, Greg and Frank on receiving a Tennis Victoria Service Award and thanks them for their contribution to tennis in Victoria. To nominate someone at your club for a Tennis Service Award visit the Award page.